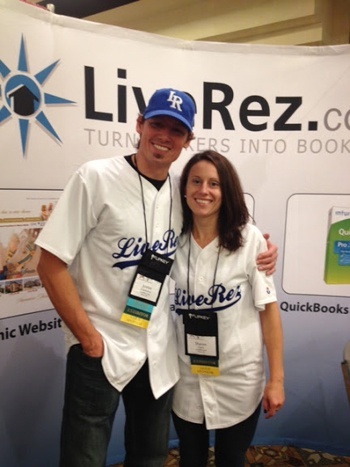 LiveRez's Juston Clarkston and Sharon Clark at the 2012 VRMA Annual Conference. Just last week the Vacation Rental Managers Association announced that this year’s annual conference will be the largest ever. According VRMA, nearly 700 vacation rental professionals have already registered for the conference, breaking an attendance record that stood six years. And the best part is that many more managers are still expected to sign up. Each year the VRMA Annual Conference is the largest learning and networking event in the industry. And, with a record-shattering attendance expected, this could very well be the best conference ever. Non-VRMA Members can save $100 using the coupon code LIVEREZ2 at registration (current members automatically get the best rates). Click here to learn more! Hotel Rooms are going fast, so make your reservations soon. More information on lodging options is available on the conference page. The conference programming is now available at VRMA.com. You may want to check it out ahead of time and plan ahead for what educational sessions you want to attend. There are multiple options for each time slot. LiveRez’s own Tyler Hurst will be giving a special session on The Fundamentals of Successful Online Bookings. Leave extra space in your luggage! The vendors at VRMA are notorious for giving out tons of SWAG (stuff we all get). You’ll want to save some extra space in your bag for all the free goodies you’ll be taking home. You may even be lucky enough to win one of the many showcase prizes. Unfortunately, if you win the free TV we are giving away, it probably won’t fit in your bag. Come see us at our booth! LiveRez will out in force at the conference, so make sure you stop by our booth and say hi. We’ll be on hand to answer all of your questions about our software. And, we’re also expecting a huge turnout of LiveRez partners, as well.